Wolfgang Schneiderhan (Wolfgang Eduard Schneiderhan) was an Austrian violinist and teacher born on May 28, 1915 (Heifetz was 14 years old.) He began his violin studies with his mother at age 3. Four years later, he began studies first with Otakar Sevcik then Julius Winkler. By age 11, he had made his public debut with the Mendelssohn Concerto (the one in e minor) in Denmark. While still very young, he lived and worked in England for a while (1929 to 1932). He returned to Vienna to serve as concertmaster of the Vienna Symphony (1933 to 1937) and then concertmaster of the Vienna Philharmonic (1937 to 1951.) He also continued to concertize and record as a soloist. From 1948, Schneiderhan was also heavily involved in chamber music performance (before it had become the popular thing for soloists to do), having formed a quartet in that year. He is remembered for his recordings of the Beethoven Sonatas (with Wlihelm Kempff as accompanist-1952), all of Mozart’s concertos for violin, and the Beethoven violin concerto. He held teaching posts in various parts of Europe, but mainly Vienna. 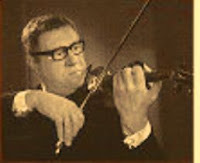 Schneiderhan had a much older brother (Walter) who was a very well-known violinist in Austria. Wolfgang Schneiderhan died in Vienna in May of 2002, almost 87 years old.